Shake Rag, located east of the old M&O (later GM&O) railway tracks and extending northward from Main Street, was one of several historic African American communities in Tupelo. By the 1920s blues and jazz flowed freely from performers at Shake Rag restaurants, cafes, and house parties, and later from jukeboxes, while the sounds of gospel music filled the churches. The neighborhood was leveled and its residents relocated during an urban renewal project initiated in the late 1960s. 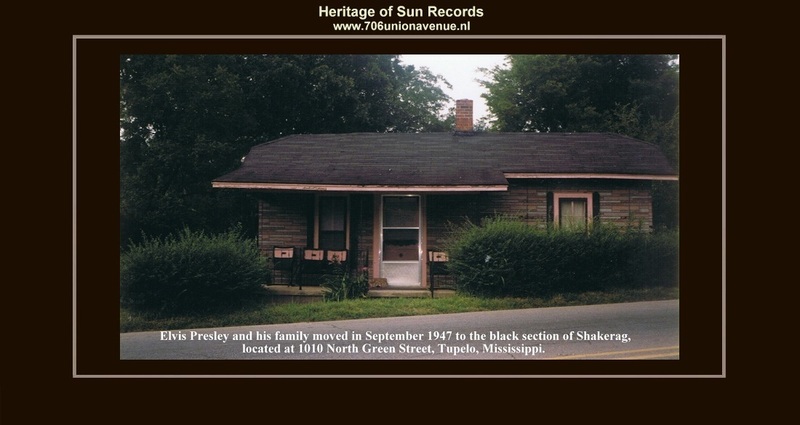 Tupelo’s blues legacy is perhaps most widely known for its influence on a young Elvis Presley, who lived adjacent to the African American neighborhoods of ''Shake Rag'' and ''On the Hill''. A local explanation for the origin of Shake Rag's name refers to people ''shakin' their rags'' while fleeing a fight. The term was also used to describe African American musical gatherings in the 1800s and early 1900s and may be related to Shake Rag’s location next to the railway tracks; prior to regular timetables, passengers would signal for the engineer to stop a train by shaking a rag. Gambling and bootlegging were commonplace in Shake Rag and although outsiders often regarded the area as dangerous, former residents proudly recalled its churches, prosperous businesses, and strong sense of community, a quality highlighted in Charles ''Weir” Johnson's 2004 documentary about Shake Rag, Blue Suede Shoes in the Hood. Blues guitarists such as Willie C. Jones, Charlie Reese, "Tee-Toc'', and Lonnie Williams played at Shake Rag house parties, on street corners, on a stage near the fairgrounds, and at the Robins Farm south of downtown, according to musicians who have stated that Elvis Presley may have been especially swayed by the music of "Tee-Toc" or Williams. Touring blues, jazz, and rhythm and blues acts performed elsewhere in town at more formal venues including the Henry Hampton Elks Lodge on Tolbert Street, the Dixie Belle Theater, the lounge at Vaughn’s Motel on North Spring Street, and the armory at the fairgrounds. In the post-World War II era George ''Bally'' Smith, a multi-instrumentalist whose repertoire included big band jazz and rhythm & blues, led the most celebrated local band. His band members over the years included bassist Charles ''Bo'' Clanton, trumpeters Turner Bynum and Joe Baker, drummers James ''Pinhead'' Ashby and Steve Norwood, guitarists Willie ''Shug'' Ewing, Cliff Mallet, and ''Guitar'' Murphy, trombonist Fred Chambers, pianist Billy Ball, and saxophonists James Brown, Jerry Baker, Augustus Ashby, Pete Norwood, and Ben Branch, who directed the band at Carver High School. Bally also led the King Cole Trio-style group Three B’s and a Bop, featuring Clanton, James Ashby, and vocalist Hattie Sue Helenstein. Bally’s groups performed on radio stations WELO and WTUP, sometimes together with vocal group the Five Rockets, which included Sam Bell and Wayne Herbert, Sr.
Nap Hayes of Shake Rag was among the first Tupelo performers to record (in 1928 for OKeh Records). Other Tupelo area natives who have recorded blues, rhythm and blues, or gospel include Aaron and Marion Sparks, Benny Sharp, Willie Pooch, Lester and Willie Chambers of the Chambers Brothers, Riley (Richard) Riggins, Lee Williams of the Spiritual QCs, and Homemade Jamz Blues Band.